It crashed. The pilot Hv. Plt. Ütgm. H. Cahit Ekin (26 years old) ejected but was sadly fatal wounded. Beneath a photo taken by Dave Schultz (Soner Capoglu collection) taken around 1989 when the aircraft had received a German style camouflage pattern. Beneath a photo taken by Clarence Fu in August 1989, seven months before it was lost. 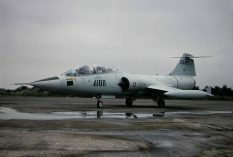 It crashed near homebase Balikesir shortly after takeoff, sadly killing the pilot Hv. Plt. Tgm. Mümin Demiralp (24). Photo beneath was stated having been taken in August 1987 but not confirmed. (Paul van der Elsaker collection). 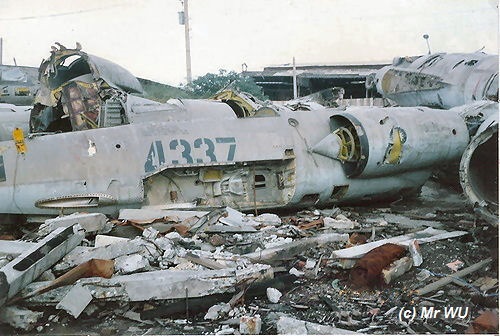 (USAF serial 63-13691) This starfighter crashed during its landing on homebase TaoYuan. The aircaft lost thrust and engine could not be restarted anymore and crashed into sea, likely headed its direction to sea by the pilot to bring it down safely. Pilot Chang Fu Yi ejected and was saved by a fishing boat and was ok. 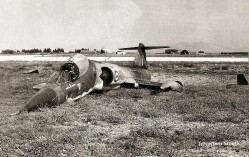 It crashed near Caltagirone at Sicilie. It was TDY stationed at Sigonella NAS. It happened just after takeoff from Sigonella and the pilot Capt Sergio Scalmana. (30) was sadly killed on impact. This day this aircraft crashed due to unknown cause near Cesaro into the Nebridimis mountains at Sicilie. The pilot Ten Vito Falco ejected but was sadly killed. It was flying TDY from Gioia del Colle Air Base. It happened when the aircraft together with 37-27 flew back home. 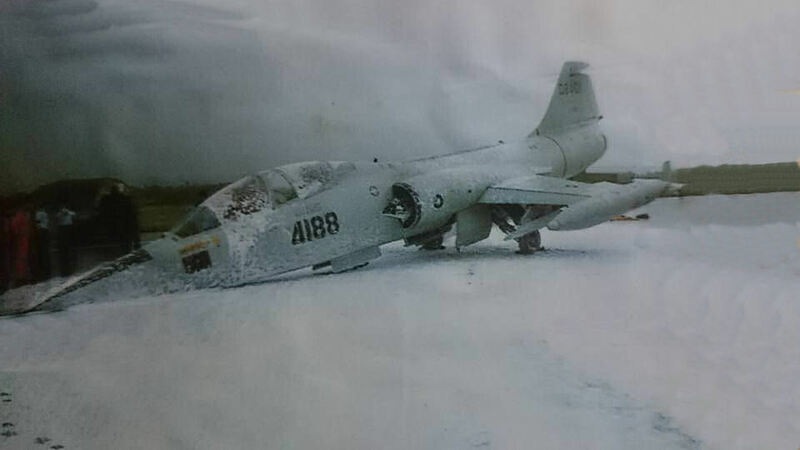 (USAF serial 63-8461) It made a crash landing (likely at Hsinchu Air Base) due to a malfunctioning nose-wheel. Both pilots Ding-Chung Tien and Lt Chao-Ming Chen were unhurt. The aircraft could be repaired. Beneath two photos of this TF-104G, taken in 1990, and the other one showing the crash landing (with chute) from the collection of Clarence Fu. 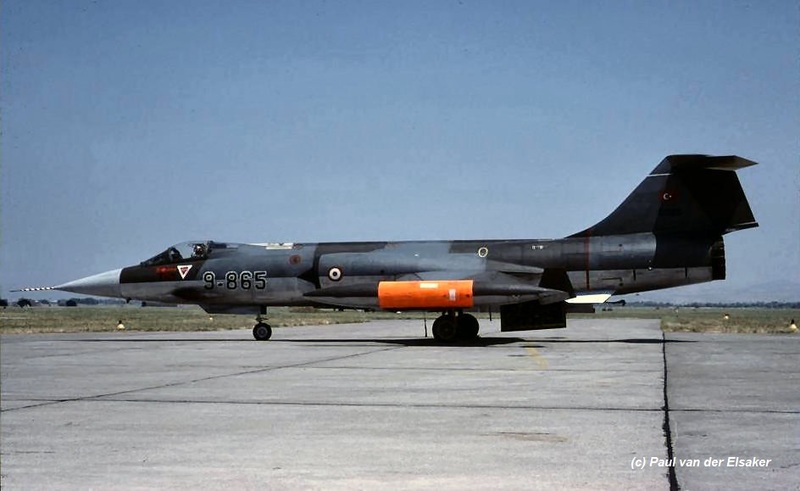 This Starfighter was written off at Larissa during a landing accident when the pilot, Captain Ioannis Foufoulas, landed the aircraft without gear due to a gear malfunctioning. The aircraft was heavily damaged and the pilot was injured although he could walk away safe. It was one of a number of aircraft on transition from Araxos to Larissa to take part in the big tri-service exercise "Parmenion". The accident happened on the last day of the exercise when the aircraft was returning to base (Larissa AFB). While landing and after few meters skidding on pylon tanks suddenly the left one was detached causing the aircraft to veer to the left only to stop several meters away broken up. The RF-104G was loaded the next day and transported to KEA Hellinikon AFB (AF Depot) for damage investigation. There a team declared it written off due to the expected repair investments and the sufficient number of aircraft available within the inventory. It was brought over the dump at Athene late 1990. Officially it was withdrawn from use on 10 July 1991. 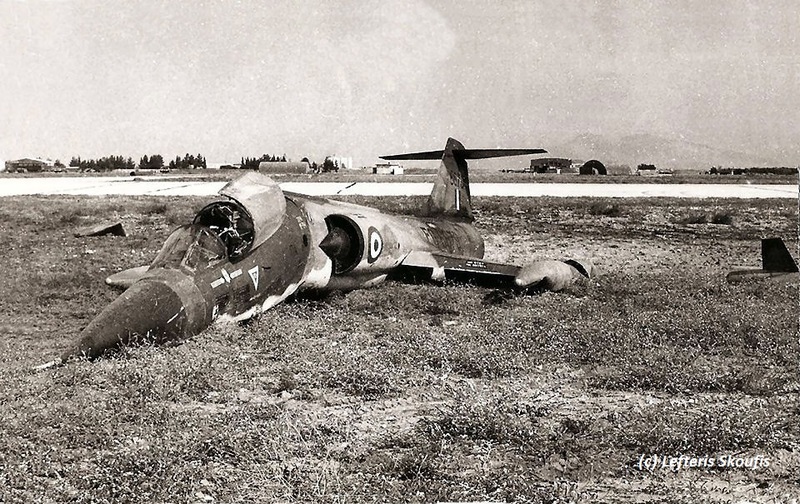 The photo beneath was provided by Lefteris Skoufis, and shows the aircraft broken up along the runway at Larissa. (FSM serial 46-8592) This aircraft exceeded the G limit (of 7.33 G) while dogfighting and desintegrated killing pilot Yan Sher Jin (28). The aircraft crashed into sea, West of Taichung. 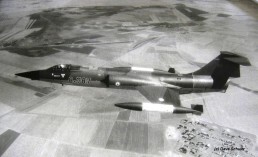 The aircraft was #3 in flight of four. Number #2 suddenly encountered a malfunctioning horizontal stabilizer, dived, and soon recovered and became under control again at low-altitude and returned to base. #3 dodged and disintegrated. Captain Yan initially declared missing. Six months later, on 5 June 1991, declared killed, treated as KIA, and posthumously promoted to Major. The small photo beneath (photographer unknown) was taken while landing in March 1990, nine months before it was lost. 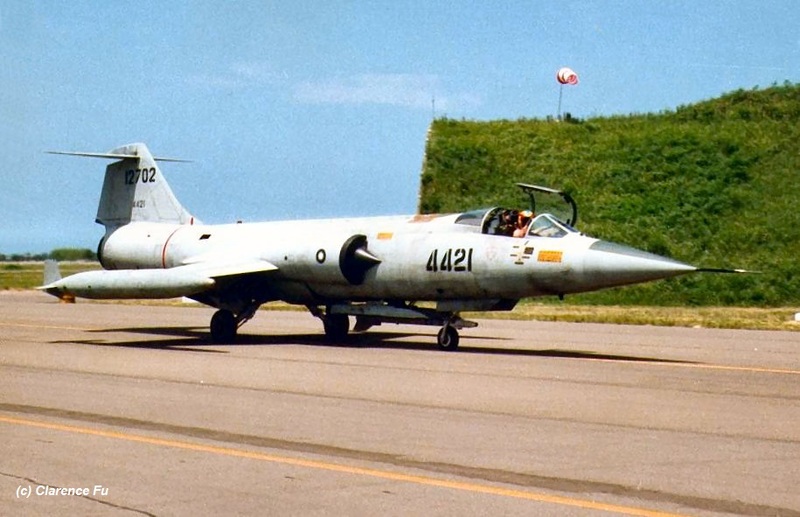 17 Dec 1990 F-104G 4340 unknown RoCAF written off pilot ? 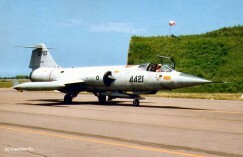 (USAF serial 64-17767) It crashed during scramble take-off. Pilot fate unknown. 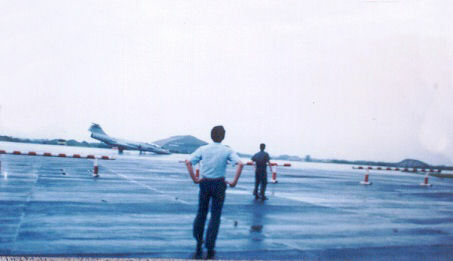 Aircraft was later on scrapped at Tainan so it is very likely that it happened at the airbase and the pilot could survive. We still are looking for confirmation. 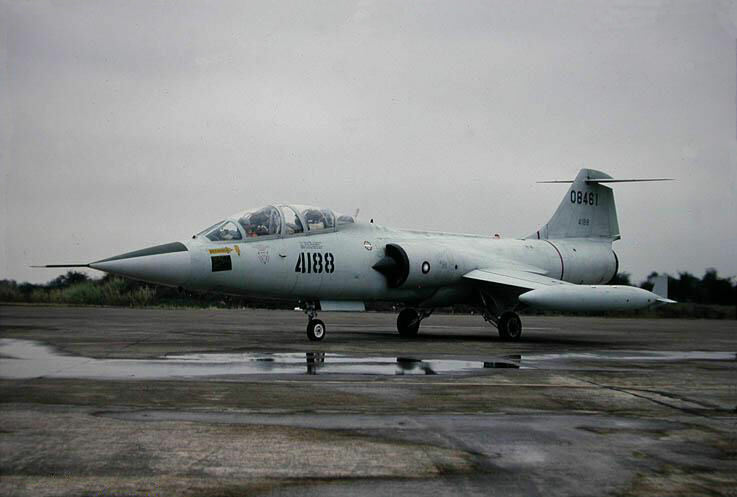 (USAF serial 66-13526) It crashed into sea near Hsinchu Air Base at 11:30 AM, while landing, pilot Dai Jia-Tser was sadly killed. The accident was caused by loss of elevator control (flaps malfunction).